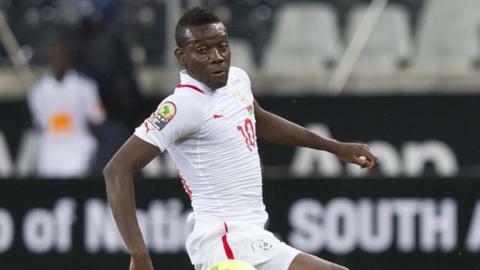 Burkina Faso striker Alain Traore has been ruled out of the Africa Cup of Nations with a thigh injury he suffered in Tuesday's 0-0 draw with Zambia. The tournament's top scorer was stretchered off after only 12 minutes and will miss his side's quarter-final. He said: "For me, the Nations Cup is finished. The injury has spoiled my enjoyment [of qualifying] a little." The team's doctor, Romaric Toe, added: "He will undergo examinations, but his competition I would say, is over"
Burkina Faso, ranked 92nd in the world, will face either Tunisia or Togo in Sunday's last-eight match in Nelspruit. They are aiming to reach the semi-finals of the competition for only the second time in their history - and losing three-goal hero Traore is a huge blow.